BRAND NEW CONSTRUCTION with modern interiors. NEW PHOTOS COMING NEXT WEEK. High end, full brick building with only 2 units. Both units are two floor duplexes with living on one floor and bedrooms on the other floor. This unit has two large master bedrooms on the upper level along with a full roof deck! Gorgeous kitchens &amp; baths, modern wall mounted electric fireplace, 1 garage parking space included and easy street parking. Tree lined street. Great opportunity to have new construction in a happening neighborhood! BRAND NEW CONSTRUCTION with modern interiors. High end, full brick building with only 2 units. Both units are two floor duplexes with living on one floor and bedrooms on the other floor. This unit has first floor living, kitchen and den with full sized slider walkouts front and back to 2 concrete patios. 3 bedrooms and 2 baths on the upper level. Gorgeous kitchens &amp; baths, modern electric wall mounted fireplace, 1 garage parking space included and easy street parking. Tree lined street. Great opportunity to have new construction in a happening neighborhood! OLD TOWN LUXURY~NEW CONSTRUCTION***BOUTIQUE BUILDING LOCATED ON A QUIET TREE LINED STREET. ABSOLUTELY STUNNING UNITS WITH DIRECT ELEVATOR ENTRY. ONE LEVEL OF LIVING FEATURES A LIGHT &amp; BRIGHT ATMOSPHERE WITH LARGE TERRACES DIRECTLY OFF THE UNITS PLUS+++ ATTACHED HEATED GARAGE PARKING. JAW DROPPING FINISHES, CRAFTSMANSHIP &amp; DESIGN BY THE AWARD WINNING NOAH PROPERTIES. KEEN ATTENTION TO EVERY DETAIL MAKES THIS DEVELOPMENT STAND ABOVE THE REST. CUSTOM CRAFTED KITCHENS &amp; LUXURY BATHS. TRUELY A RARE FIND. AMAZING LOCATION CLOSE TO THE HEART OF OLD TOWN AND ALL IT HAS TO OFFER. Units are ready to show. FOUR EXCEPTIONAL LEVELS OF LUXURY LIVING! Ideally located in charming downtown Wheaton. Walking distance to fine dining, boutiques, train, French Open Market &amp; Prairie Path. Professionally designed interior features Restoration Hardware, Serena &amp; Lily &amp; Kartell mirrors, lighting &amp; window treatments as well as built in 3 zone Sonos sound system. Main flr offers living room w/gas FPL &amp; built in seating. Open concept kitchen in today&apos;s colors w/ expansive breakfast island, upgraded GE Cafe SS appliances, Macauba quartzite &amp; Urban Electric Co Harper pendants. 2nd flr boasts 2 master en suites &amp; laundry rm. 3rd Flr is a FABULOUS entertainment area w/wet bar, doors leading to the terrace, perfect for sunsets &amp; views, plus BR &amp; full bath. The basement features 4th bedroom or office &amp; full bath. Elevator shaft used as storage. HOA includes gorgeous pool, fitness center and hospitality suite for parties or meetings. A BEAUTIFUL home blending w/ the CAPTIVATING Wheaton Community! Gorgeous extra-wide 3 bedroom/ 2 bath in an all brick eight unit building on a tree lined street in Lincoln Park near parks and transportation. The home features transitional finishes with beautiful hardwood floors thru-out, ccrown molding, gas fireplace with marble hearth and custom mantel and bookcases, surround sound and speakers and custom window treatments. Chef&apos;s kitchen with 42&quot; white wood cabinetry, SubZero, Wolf and Bosch stainless steel appliances and large breakfast island which is perfect for entertaining. The Master Bedroom Suite has a customized walk-in closet and a fabulous bath with heated floors, double vanities, steam and rainshower. There are two wonderful outdoor spaces - a 24&apos; X 6&apos; terrace off the living room and a private deck on top of the garage. One garage space included in price. Stunning 3 bed/ 3 bath spacious and bright condo in Belgravia&apos;s SL - Sedgwick at Locust featuring 10.5-foot ceilings, a split bedroom layout, expansive windows, large laundry and storage room, a spacious balcony and beautiful hardwood flooring throughout! The integrated kitchen features stainless steel Jenn Air appliances, a Sub Zero custom wine fridge and beverage center, quartz countertops and island, and custom Italian cabinetry. Just minutes from the train, Michigan Ave, art galleries, fine dining, nightlife, the highway, and now located within the newly merged and highly rated Ogden school district. 1 tandem parking spot (fitting 2 cars) included! PENTHOUSE condo in A+ Old Town location! Built in 2015 by BAK Home Development. All-brick building on a quiet tree-lined street. Come home to a dramatic open floor plan garnering tons of natural light! Custom Italian kitchen boasts Wolf, Viking, Bosch, and Quartz countertops. The Master suite has a walk-in closet, dual vanity ensuite spa-like bath, heated floor, steam shower + body sprays. The private full rooftop has the most amazing skyline views. Garage parking included!! 2 blocks to Sedgwick CTA brown line stop and 2 blocks to all that Wells Street has to offer! Down the street from North Ave. Beach, the Chicago History Museum, and nearby the Lincoln Park Zoo. Only .2 Miles from the Brown and Purple Line at the Sedgwick Subway station. Incredible location!! Come check out this gorgeous 4 bed, 2 bath penthouse at The Stanton, a 14 unit, boutique, 2017 construction, elevator building, offering the best of modern design and urban living. This unit features an open layout with an abundance of natural light. This north and west facing corner unit features an enormous 37x7 private terrace. Deluxe kitchen with exquisite finishes including European cabinetry, oak floors, quartz countertops and top of the line stainless steel appliance package. Huge closet space, large bedrooms, private outdoor terrace and beautifully constructed spa-like bathrooms. Includes heated garage parking, bike space, additional storage and access to the breathtaking common rooftop deck that nearly touches Chicago&apos;s picturesque skyline. Located at the intersection of Old Town, Lincoln Park, and River North. Easy access to the Red Line, 90/94, Lake Shore Drive, Target, Marianos, Whole Foods, countless restaurants, nightlife, movie theater, bowling alley, and more. View our virtual 3D tour! 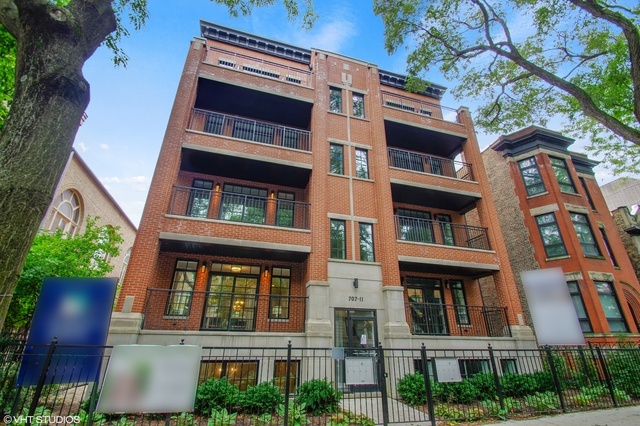 INTRODUCING BRAND NEW LUXURY CONSTRUCTION IN LINCOLN PARK! Norweta Club, built by design led development firm Broder, offers 32 single floor &amp; duplex residences in 2 gorgeous boutique elevator buildings. This LEED PLATINUM CERTIFIED unique development offers an incredible resort-like lifestyle, w/ amenities that are unheard of in the city. Outdoor pool, state of the art 24/7 fitness center, high-tech business center, guest suite, plus nearly 1 acre of outdoor amenity space complete w/ fire pit, dining with BBQ grills, sports court, hammock garden, Four season solarium, horizontal climbing wall, &amp; more! Norweta Club also comes complete w/ first-class on-site property management, indoor car wash station, indoor dog wash station &amp; pet relief area, bike storage, courtesy bikes, &amp; heated garage.These thoughtfully designed floor plans offer beautiful interior finishes &amp; every unit has its own incredible private outdoor terrace or yard. Brand new construction penthouse duplex-up on an extra wide, corner lot, overlooking Holstein Park. 3 Bedroom/2.5 Bath featuring oak hardwood floors, contemporary kitchen, thermador appliance package, quartz countertops with full backsplash. Designer curated finishes with master suite &amp; spa-level bath with oversized steam shower. Three great outdoor areas for entertaining, two off of the living space and a private rooftop deck. Steps to all that Bucktown and Wicker Park has to offer. Pictures are of duplex down- finishes will be the same, bedrooms are hardwood. Exactly what you have been looking for- a 3 bed plus den, Belgravia Group home, at a price never imagined - Triangle Square Condos, coming to 1701 W. Webster Ave, overlooking the North Branch of the Chicago River in East Bucktown. Welcome to Residence 406, an exceptionally designed, 3bed+den/3bth home. Enter into a gracious foyer with guest closet, then turn the corner into a 17&apos; wide kitchen which opens to your living/dining room. Savor warm weather days on your 22&apos; wide private balcony. A den off the kitchen provides flexible space for an office, toy or television room. A private en-suite secondary bedroom is split from the master and third bedrooms, making it perfect for guests or nanny. The master suite is separate from the main living area &amp; features 2 generous closets &amp; a luxurious master bath. The large laundry room is a must for single-family living all on one floor. Located in the Pulaski School boundaries. Don&apos;t miss this one! Foxford Station is a first-of-its-kind luxury condo complex in Western Springs. Located steps away from train, shops and restaurants, the convenience of a 25-minute commute to the city can&apos;t be beat. The gracious architecture is complemented by impressively-sized units filled with natural light. The exceptional finishes include Bosch appliances, Grohe and Kohler fixtures, Quartz countertops and porcelain tile. 8 possible cabinet styles and 4 door styles are available for you to select. Each unit includes a balcony or terrace overlooking the town and potential city views (depending on the unit). Large master suite features a sizable shower and separate soaking tub. Same-floor external storage space included. On track for a Summer 2019 completion, 10 units are already spoken for. With only 18 units still available, now is the time to check out the hottest new building in the area.